A woman who accused Virginia Lt. Gov. Justin Fairfax of sexually assaulting her in 2004 hired Christine Blasey Ford's legal team to represent her. Gov. Ralph Northam kept avoided the public on Tuesday, amid ongoing calls for his resignation. News4's Julie Carey reports from Richmond. A California professor who accused Virginia's Lt. Gov. 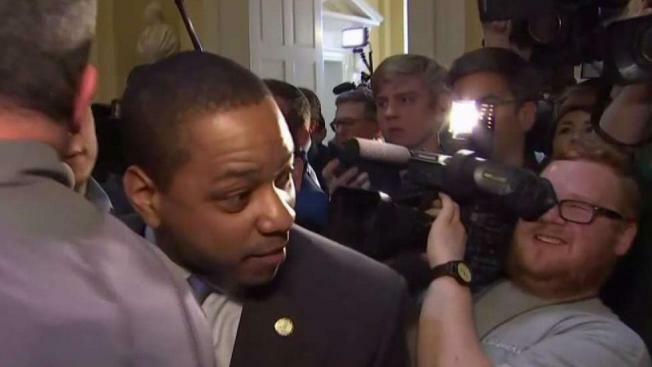 Justin Fairfax of sexually assaulting her 15 years ago hired Christine Blasey Ford's legal team to represent her, NBC News reports. Vanessa Tyson, who is on leave from her position as an associate professor of politics at Scripps College in California, accused Fairfax of sexually assaulting her at the 2004 Democratic National Convention. A member of her legal team gave NBC News permission to publicly identify her. Fairfax, a married, 39-year-old father of two, said Monday that when he was 25, he had a "100 percent consensual" encounter in a hotel room with a woman he met at the convention, which was held in Boston. He was not married at the time. "At no time did she express to me any discomfort or concern about our interactions, neither during that encounter, nor during the months following it, when she stayed in touch with me, nor the past fifteen years," Fairfax said in a statement released Wednesday. "She in no way indicated that anything that had happened between us made her uncomfortable." He further said that he first heard the allegation when approached by members of the media before his inauguration in 2018. The Washington Post wrote that the paper decided against publishing a story about her claim after reporters were unable to corroborate Tyson's claims nor find other, similar allegations against Fairfax. According to the Post's article Monday, Tyson described an encounter that began consensually and ended with a forced sexual act. NBC News reported Wednesday, citing two sources, that Fairfaix used profane language about his accuser, Dr. Vanessa Tyson, in a private meeting Monday night. Fairfax said in a statement Wednesday that "in my remarks on Monday, I think you could hear how emotional dealing with an allegation that I know is not true has been for me." Tyson hired Katz, Marshall & Banks, the same prominent Washington, D.C., law firm that represented Blasey Ford in her accusation against Supreme Court Justice Brett Kavanaugh. Tyson's supporters have rallied online around the tag #IBelieveVanessa. Her Twitter page says she will participate in a public event on Feb. 12 called "Betrayal and Courage in the Age of #MeToo." On Tuesday, Fairfax called the revelation a political smear. The allegation initially surfaced Sunday on the conservative news and commentary site Big League Politics, which also broke news about a racist photo on Gov. Ralph Northam's 1984 medical school yearbook page. Calls for Northam to resign over the photo thrust Fairfax into the national spotlight, as he would be poised to be the state's next governor. Many lawmakers on Tuesday refused to comment on the accusation against Fairfax. Others said they need more information. "We don't have all the information, but we take any allegation of sexual abuse or harassment very seriously," said Virginia Sen. Louise Lucas, a Democrat. "So we are going to wait to see how that information evolves."